The advantage of this tracker app is that it visualizes the movement over time. However, it's difficult to see the locations on the map and since it's using a heat map to display the frequency that each location was in my DB -- that is, it's hard to see some of the smaller dots on the maps. As you can see, I spent most of my time since March in College Station and Waco, TX. 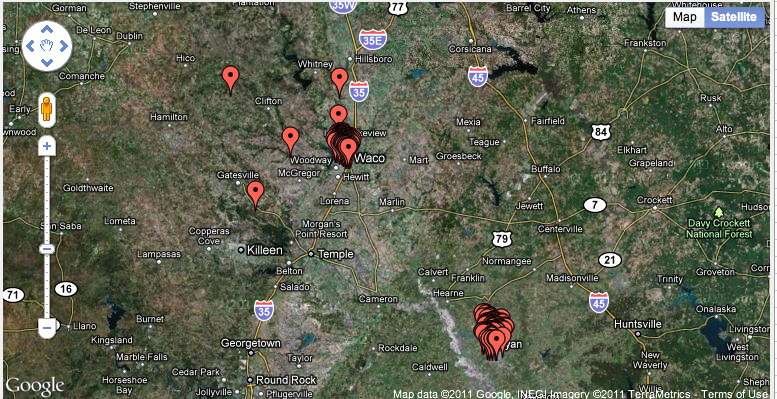 The dark purple spot in CS is near my building on campus. There are a couple of reasons that, after looking at this data, I am not too concerned about the tracking capability. First, when examining the timestamp data and my location, it is off by a few hours and even a full day in several cases -- such as the days I traveled to Waco. Also, notice that the tracking did not pickup any locations during the drive to Waco (I guess that's because I didn't use it for GPS directions and there probably aren't many wifi locations between College Station and Waco). Finally, the tracking it not very precise. There are lots of small dots on the map that show locations I've never been, including the dots far outside of Waco near Gatesville and Hico. Also, when I zoom in on the map and examine the records in the DB, it puts in lots of places in the College Station area that I haven't traveled to in the last month. My only guess is that the blips are due to wifi hotspots or cell towers that my cell phone connected to but have either 1) a really long range or 2) somehow have inaccurate longitude/latitude entries. This google map shows the erroneous entries points more clearly. Thinking that this might have to do with the "horizontal accuracy" column in the DB, I examined the raw data for these erroneous locations, but "horizontal accuracy" was about the same as all the entries, so it wasn't an accuracy problem. Regardless, I'm not too worried about Apple or someone else using this data for no-good. 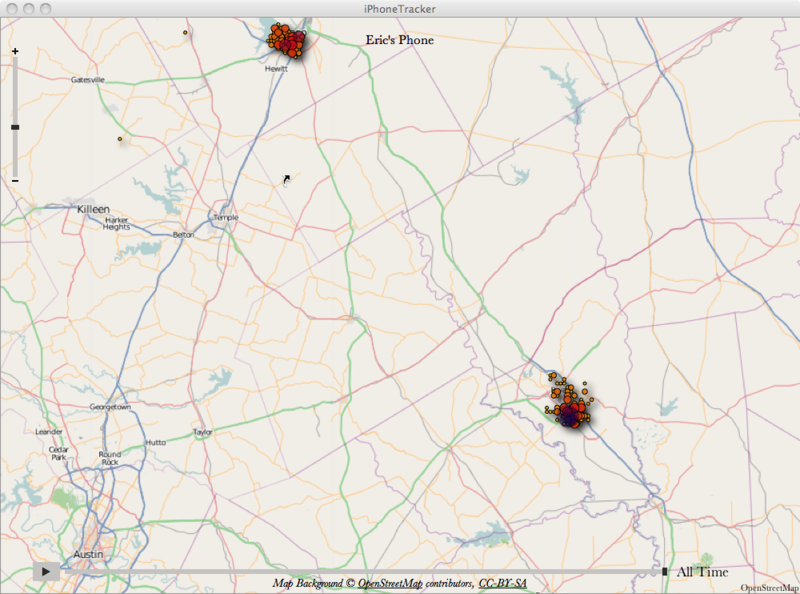 Crowdflow.net is looking for donated iPhone tracking data so that they can make visualizations like this one. They'd better hurry and gather the data they need before the next iOS update that makes this tracking file more difficult to locate/access. Thanks for sharing the wonder article, SAS is the recent technology, you must learn this valuable course to get future in IT firm.